Horace John Smith was born in Yeovil in 1886, the son of mason and bricklayer John Smith (1850-1906) originally from Broadwindsor, and Mary Ann née Masters (1853-1893). John and Mary were to have nine children; Herbert (b1876, Martock), Fred (b1877, Dorchester), Edith Mary (b1878, Dorchester), Ada (b1879, Martock), Arthur (b1883, Yeovil), Horace, Amy (b1887, Yeovil), William (b1890, Woolston) and Mary May (1891, North Cadbury -1948). From the birth places of the children it is obvious that the family was somewhat peripatetic, perhaps as John sought employment. The 1891 census saw the family at North Cadbury and the 1901 census saw them at Bemerton, Wiltshire, at which time 16-year old Horace was a bricklayer like his father. In the summer of 1909 Horace married Ethel Annie Kenway (b1886, Poole, Dorset) at West Ham, Essex. They set up home at 11 Hill View, Sidmouth, Devon where their daughter Doris Ethel was born in 1910. Horace enlisted at Chard although it is not known when. He initially joined 7th Hussars with the Service Number 27618 but was transferred to the 13th Battalion, Tank Corps where his Service Number was 301573. Both his Service Numbers suggest Horace did not enlist until 1917. Originally formed as Companies of the Heavy Section MGC, designated A, B, C and D, each Company consisted of 4 Sections of 3 tanks of each type (male and female Mk 1’s). Companies also had another machine in reserve. In November 1916 the Companies were expanded to Battalions, carrying the same letter designations. A Battalion consisted of 3 Companies. Three mobile workshops provided the Engineering back-up to service the tanks. An expansion programme was ordered by GHQ, to build a force of 14 additional Battalions. The Tank Corps was formed from the Heavy Branch MGC on 27 July 1917 and the Battalions adopted numbering rather than letter designations (although tank names followed the same lettering: for example, 7th Battalion tanks were all named with a letter G, like Grouse, Grumble, etc.) Each Tank Battalion had a complement of 32 officers and 374 men. It seems likely that Horace joined the 13th Battalion, Tank Corps on its formation. By April 1918 Horace had achieved the rank of Corporal but was seriously wounded in action. According to the Army Register of Soldier's Effects, Horace died in a dressing station in Germany on 30 April 1918 (although he was buried in Belgium close to the French border). He was 33 years old. 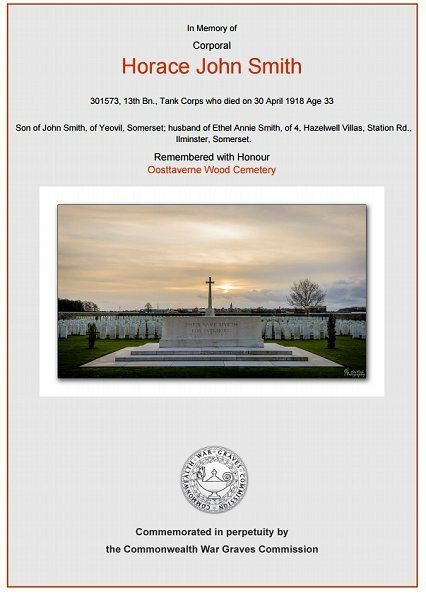 Horace Smith was buried at the Oosttaverne Wood Cemetery, Heuvelland, Belgium, Grave I.V.5. His name was added to the War Memorial in the Borough in 2018. The Commonwealth War Graves Commission certificate in memory of Horace Smith. 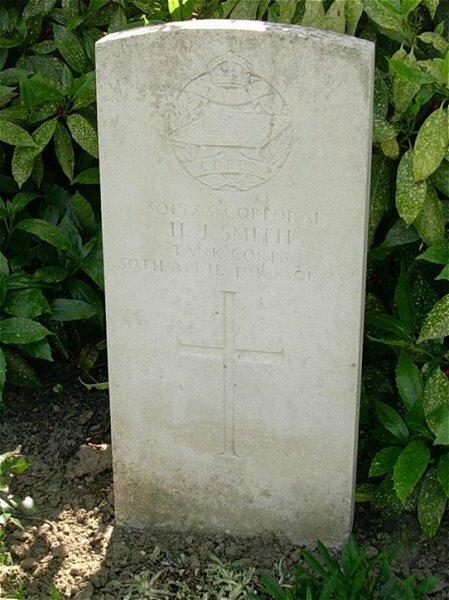 Horace Smith's Commonwealth War Graves Commission headstone at Oosttaverne Wood Cemetery, West-Vlaanderen, Belgium.